Podtrac has launched a third podcast ranking chart. 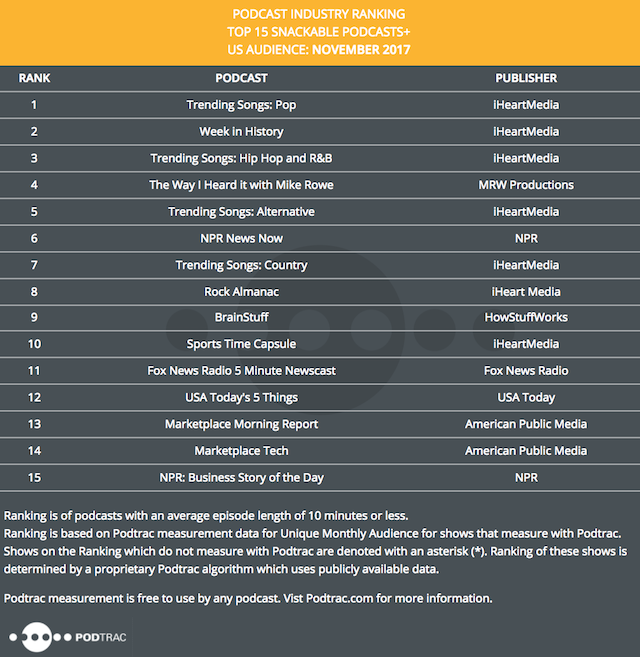 In addition to its monthly list of the top podcast publishers and the top podcasts, the company has debuted a third ranker called Top 15 Snackable Podcasts. This new chart only contains podcasts where the average episode is 10 minutes or less, and it effectively breaks the Top 20 Podcasts chart in two, increasing the number of “top” shows to 35 programs of all lengths. As with the other show chart, placement in the Snackable list is determined by unique monthly audience data for the podcasts that measure with Podtrac. Shows that are not Podtrac clients are ranked and placed in the chart based on feeding publicly available data into a Podtrac algorithm. Podtrac has not made any official statement about the new monthly report. After last month’s Top 20 Podcasts report was published, RAIN noticed some comment and criticism of one included program in the October Top 20 which was one minute long. That show, iHeartMedia’s Trending Songs: Pop is an extremely concise rundown of current hits, and lands in the #1 spot of the new Top 15 Snackable Podcasts report.